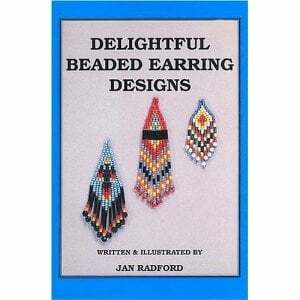 This small paperback book, Delightful Beaded Earring Designs, is written and illustrated by Jan Radford. At $8.95, it is an affordable introduction to ‘Indian’ style beaded earrings made with small glass beads. It has a somewhat dry, thin feel to it, but for someone interested in a straightforward text on the subject it should be useful. Jan RadfordEagles View Publishing, A Westwind Inc. There is a clear introduction which recommends a careful reading of the book and an appreciation of the importance of the basic steps in small seed bead stringing. The text exhibits a good understanding of tools and materials. Step by step directions for making the earring foundations and short sections on supplies, adding thread and removing unwanted beads provide the technical instruction of the book, much of he rest being depictions of different possibilities for earring designs. Sections include Bugle bead foundations, single, double and triple beaded tops, Double beaded seed bead foundations, Triple beaded seed bead foundations, loop dangle earrings, porcupine quill or long bugle bead earrings and miscellaneous earring styles. Each technical recipe for making a particular seed bead earring design is accompanied by line drawings and a black and white photograph of the earring in question. The photos are helpful as the diagrams sometimes lack clarity with no nomenclature on them, leaving it up to context for one to guess at which part is foundation and which ‘dangle’ or ‘bugle bead’ (they are the long tubular ones). There are over 80 specific patterns for earrings accompanied by drawings and photos in the book, certainly enough for an interested person to learn a fair bit about the subject. For me the idea of just making apparently limited variations on beaded earrings is a bit minimal but I know there are many people fulfilled by this kind of strict recipe information. It might too be a good way for someone to start jewelry making and again, for a person who wants to learn the techniques for beaded earring making this book will work. A serviceable text.